Wileyfox launched this second generation of Swift phones towards the end of last year. You may be wondering why it has taken Tested Technology five months to get round to reviewing them. We haven’t been sitting on our hands. The hands have definitely remained in the ON position. Regular readers will know that we don’t rush to be first with the news, and we take the “Tested” part of our name very seriously indeed. 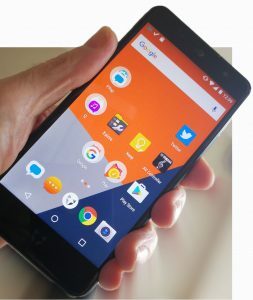 The early reviews of the Swift 2 series that emerged centred around the Cyanogen operating system that Wileyfox had been bold enough to make its unique selling proposition since the very first Swift was launched in August of 2015. But even as the Swift 2 appeared on the 2nd of November last year, the signs were that Cyanogen Inc, the US providers of the Cyanogen operating system, was a company in trouble. To insiders, it was clear that the Cyanogen Inc would not be around for much longer, and their operating system, an elegant version of standard Android, was destined for oblivion. When Wileyfox came to the same conclusion, the company announced that it would transition to its own variant of Android, eventually rolling this out across its whole existing range. On this basis, Tested Technology took the decision to hold off its review until the new operating system appeared. This was initially due by the end of March. In the first weeks of April it finally arrived, based on—and this was a welcome surprise—the very latest commercially available Android, version 7.1.1. THERE ARE THREE MEMBERS of the Swift_2 series, the Swift 2, the Swift 2+ and the Swift 2X, with a colour choice of Midnight, Gold, Rose or Mint. The ones I’m reviewing here are Midnight. Or, as we technical people call it, Black. All these phones are dual-SIM, with a mostly metal body and Gorilla Glass 3 screen protection. They’re all built around the same guts: a Qualcomm MSM8937, 64-bit Octa-core central processor running at 1.4GHz with an Adreno™ 505 GPU. All of them do Qualcomm’s Quick Charge 3 through a USB C connector. There’s a fingerprint sensor in the back panel, below the main camera (absolutely the right place, in my opinion). For smartphones in this sub-£200ish price bracket (the poshest one, the 2X is around £220) this is an impressive feature set. The main sacrifice is the 5GHz wireless band and the higher transfer speeds this makes possible for very much pricier flagship phones capable of 802.11ac. But there’s no stinting on the GSM phone side of wireless. It’s 4G/LTE. (Well, maybe a little stinting—it’s UK and European 4G/LTE, not global). I understand that the battery is technically user-replaceable. But unlike the iPhone, no kit to do this is available on the market. Apparently, you need to do some deft heating to separate the casing from the chassis. I can’t say I missed 5GHz much. But I do lament the passing of one of Wileyfox’s key selling features that I praised in earlier reviews. In keeping with the fashion for slim-lining, the batteries of the new Swift_2 range are all permanently entombed. OK, we like our phones thin, and quick-charging may for some people make battery-swapping unnecessary. But all the same, I don’t like the feeling that after a couple of years I’m going to have to chuck away a faithful vade-mecum just because I can no longer power it up. 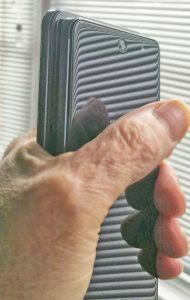 Today’s smartphones are miracles of compute power miniaturisation. With one notable weak spot: the battery. As we use these things more and more, it’s a tough proposition to stuff all the juice we need into the slim profiles we seem to crave. Battery technology is improving but is hardly keeping up with the rest of the ballgame. If physical access to the battery is no concern to you, Quick Charge 3 may be your ideal solution to the problem. Second best to being able to swap out a depleted battery for a fresh one (about 30 seconds when I was using my Samsung Galaxy Note 3) is the ability to whoosh up the charge from 5% to 50% in 30 minutes. That’s Wileyfox’s claim for the Swift_2 and the Swift 2+, phones with the smaller 2700mAh battery. And our tests showed this to be accurate within a minute or two. With this initial version of Nougat it’s not possible to see from the lockscreen whether Quick Charge is working. The legend just says “Charging”. I understand that this will be fixed in the next (imminent) over-the-air operating system update. The Swift 2X uses a 3010mAh battery. With this approximately 12% larger capacity you might expect Quick Charge time to be increased by the same amount for the Swift 2X. It isn’t (see box below). I’ll pass lightly over the Swift_2. It’s the Swift 2+ in all respects except that it has a slightly less talented camera, and the storage is only 16GB with 2GB of RAM. This is more than enough for ordinary day-to-day smartphone use, particularly as there’s an option to use the second SIM slot for a microSD card up to the capacity of 64GB. The basic Swift 2 is a very respectable entry-level device. As its name implies, the Swift 2+ is a memory-enhanced version of the basic Swift 2 for the more demanding user. It has 32GB of storage and 3GB of RAM. The main camera’s bumped up from 13Mpx to 16Mpx with an improved sensor that gives better low-light pictures. This new Samsung sensor includes PDAF (phase detection auto focus) which is a step up from the basic contrast detection used in most other cameras. Contrast detection looks for the edges of shapes in the picture (which is where the greatest differences in luma will be) and shifts the lens system in and out until that difference (the contrast) is maximised. At this point the edge will be in focus. Phase detection examines the incoming light beams from opposite edges of the lens system, effectively using them as a triangulating range-finder. The key advantage is that the focussing information can be calculated instantly and the lens system adjusted accordingly with no need for it to fiddle around the optimal position before settling down. You could say that contrast detection is an automated version of the manual trial-and-error of focussing a telescope, whereas PDAF resembles an automatic measuring stick feeding back precise ranging information in real time. Does the Swift 2X’s 12% larger 3010mAh battery increase Quick Charge times by the same amount? Actually, no. Wileyfox’s own figures give the increased charging time as 33%, and this accorded with our own tests. So QC3 charging is noticeably less effective on the larger Swift 2X. The Swift 2X is top of the current Wileyfox range. It has the same guts and camera as the Swift 2+, with the extra £30 buying you three things: a bigger battery and full HD resolution on a (very slightly) larger screen. The bigger battery is welcome, and probably necessary with the resolution being pushed up from 720p to 1080p. The larger size is a puzzle, though. In Wileyfox’s economy range, the Sparks, the X version delivers a 5.5″ 1080p screen as compared with the Plus version’s 5″ 720p screen. The whole body of the Spark X is noticeably bigger, as a result, and there’s no mistaking the two phones. The Swift 2X (rear) and the 2+. The difference in size is barely noticeable unless you hold them together like this. You might expect the Swift 2X to follow suit with a 5.5″ screen of its own. In fact, the Swift 2X only goes to 5.2″. Yes, it’s bigger and the body of the 2X is larger accordingly. But not by much. By so little, in fact, that during this review I had to keep putting the two together to determine which was which. I’m puzzled by Wileyfox’s marketing decision here. The higher resolution only pays off if you’re screen-mirroring something like photos onto a much larger display using Miracast. The operating system doesn’t offer Miracast, and the built in Chromecast system transfers data, not pixels, so the screen resolution is irrelevant. On the phone’s own 5.2″ screen full HD makes the text a tiny bit crisper, but there really isn’t much in it. Not thirty quid’s worth, I’d say. 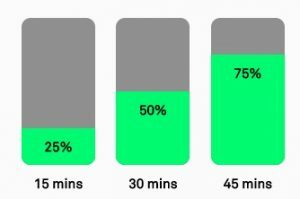 With more pixels to push around, the larger battery’s depletion time turns out to be not significantly longer than the other Swift 2s and—as we’ve seen—the quick charging actually suffers from this larger capacity. A discussion of the all-important new version of the Wileyfox operating system follows in part 2.